Renton’s Ace Aviation builds a new facility around an eye-catching centerpiece. Also, tech veteran Kal Raman debuts the latest online residential-real-estate brokerage; and Starbucks finds its Frappuccino targeted for consumer warnings in San Francisco. As a 9-year-old in Cedar Grove near Renton, Kurt Boswell would watch planes fly overhead and dream of becoming a pilot. At 14 a family friend took him up in his airplane and gave Boswell a job helping around his business, Ace Repair. That was all it took — he was hooked. Thirty years later, Boswell is the owner of Ace Aviation and aims to inspire new generations of young people to join the aviation industry. 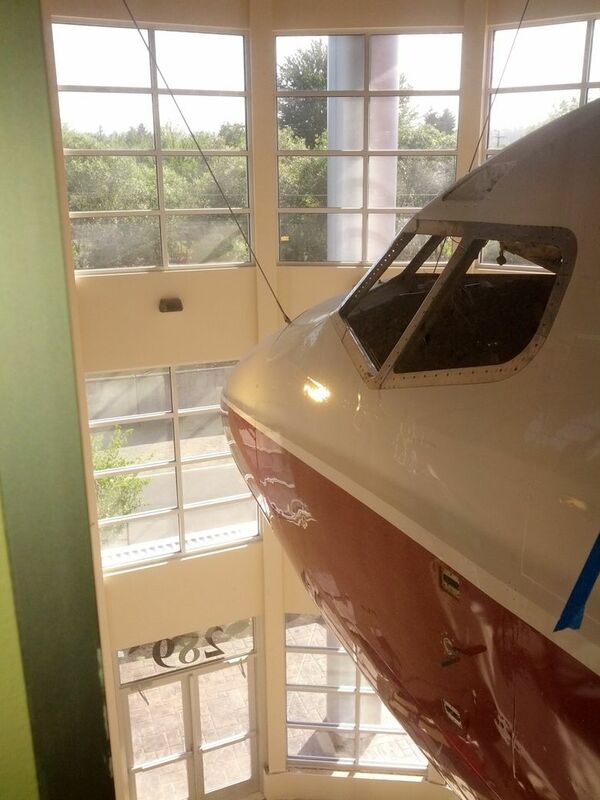 Protruding from the wall of the three-story entryway at his company’s new 32,000-square-foot maintenance facility at Renton Municipal Airport, Boswell has installed the cockpit of a 737, where he hopes kids — or adults — will be able to play and learn about aviation. Boswell started his business in 1996 at age 26, naming it to honor his mentor, Ron Felton, who died in a fire when Boswell was only 16. “Ace Aviation was kind of a tribute to Ron and Ace Repair … It was where this young teenager started to gain some direction,” he said. Boswell knew he wanted to include the nose of a 737 inside his new building before starting the project last year, but it proved to be harder than he thought. First he had to locate one, which isn’t as simple as driving to the nearby Boeing factory to pick one up. After some failed attempts, he resorted to eBay and bought it from a Southern California company that usually deals in movie props. Because of the cockpit’s size, it was trucked as an oversized load to Renton. But that turned out to be the easy part, he said. Boswell, the designers and the construction crew had to figure out how to install the nose. They realized there was no way it could be installed once the building was complete. So, they built the building around it. “Electricians, plumbers, framers, Sheetrock workers, painters, window installers … they all had to do all their work around it without one thing falling on it,” he said. The nose was painted before installation, but it still needs to be refurbished on the inside to be ready for the kids. Ace Aviation has been in a temporary facility for a year while the new, bright-red facility was built. It is about three times the size of two hangars that were demolished to make way. The extra space will allow for more maintenance work, which is the core of the company. The larger building was also specifically designed to allow work on certain large float planes that were too tall to enter the previous hanger, Boswell said. With its new facility, Ace will now also sell avionics such as GPS systems and autopilots, as well as serving as a parts warehouse and a small retail area for books and sweatshirts with phrases such as “I’d rather be flying.” Aviation Training Center will also relocate from Boeing Field and rent 2,000 square feet of the Ace facility. With more space, Ace Aviation expects to expand from 13 employees, hiring at least five more mechanics within the year as well as avionic techs and administrative support. In the crowded world of online real-estate media startups, Seattle technology executive Kal Raman launched a new virtual brokerage last week that markets itself as an end-to-end solution for consumers buying or selling a home. Raman, who has held senior positions at Amazon.com and Groupon and was CEO of drugstore.com, says Xome (pronounced “Zome”) is a “national one-stop brokerage” for consumers who want to save money and like having one company coordinate the players in a transaction, including inspectors, underwriters, insurance and escrow agents. While Xome’s corporate headquarters is in Lewisville, Texas, near parent company Nationstar Mortgage Holdings, the brains are in Seattle: Raman has about 75 people working for him here, most of them engineers or product specialists. He expects that number will triple in the next two years as Xome expands. Finding a home or a real-estate agent online is relatively simple, but “what happens after that is uncoordinated and disconnected. It’s a black box,” Raman said. In response, Xome has developed a customer dashboard that shows users where they stand at each major step of the process. Where the law allows it, Xome promises to rebate to users at least 1 percent of the value of the home they buy or sell. For example, the buyer of a $500,000 house would receive $5,000 back at closing. Real-estate agents in Xome’s network bid for buyers and sellers and pay Xome a referral fee between $300 and $1,000 for every deal that closes. Xome says its agent network includes about 560 agents in the Seattle metro area. The startup’s website shares some similarities with Seattle-based Redfin, which also rebates part of the real-estate agent’s commission. But Redfin’s rebate has diminished with time and can vary, whereas Xome offers a minimum rebate of 1 percent. Xome users will be able to apply to get prequalified for a loan through Nationstar. But eventually they’ll also be able to shop for other lenders on the site, Raman said. Xome’s affiliates will provide inspection, appraisal, title and escrow services. These affiliates, which already serve Bank of America and Chase, are where Xome expects to make money, besides referral fees from brokers, Raman said. The entire process of buying or selling a home is a $120 billion market, Raman said. Officials in San Francisco say its controversial measure to require warning labels on soft-drink billboards also would target Starbucks’ Frappuccino, Bloomberg reports. The law draws Starbucks and its signature frozen-coffee shake into a battle between local politicians and beverage companies, which feel they’re being unfairly targeted while high-calorie foods like doughnuts get a pass. The measure would cover advertising for 93 Starbucks stores in San Francisco, potentially forcing the chain to tweak its signs and promotions. The company is reviewing the ordinance “to evaluate the impact,” said Sanja Gould, a spokeswoman for Seattle-based Starbucks. A standard 12-ounce Frappuccino, generally made with coffee, ice, milk and sugary flavored syrup, has more calories than a 140-calorie can of Coca-Cola. Even versions with nonfat milk and no whipped cream typically pass that threshold, according to the Starbucks website. While the new rules exempt some coffee drinks, that exception doesn’t apply to blender beverages like Frappuccinos, according to Jeff Cretan, legislative aide to the measure’s sponsor, Supervisor Scott Wiener. Companion ordinances also would ban sugary-beverage ads on city-owned property, and the government would no longer use its money to buy sweetened beverages. A second and final vote is set for June 16 before the measure goes to the mayor. The decision to approve the measures came after San Francisco voters in November rejected a ballot measure to impose a tax on sugary drinks. Voters in the nearby city of Berkeley, meanwhile, approved a 1-cent-per-ounce tax on soft drinks and other sugary drinks. CalBev, the trade group representing the nonalcoholic-beverage industry in the state, has called the San Francisco measure unfair. The organization speaks on behalf of Coca-Cola, PepsiCo and Dr Pepper Snapple Group.